How to Find a Corkscrew That Actually Works! We have thoughtfully constructed a high-quality corkscrew that won't leave you guessing whether you'll be able to open your next bottle of wine or not. De Rigueur's Promise: If you are not satisfied with your purchase, you will receive a replacement or your money back with no questions asked. 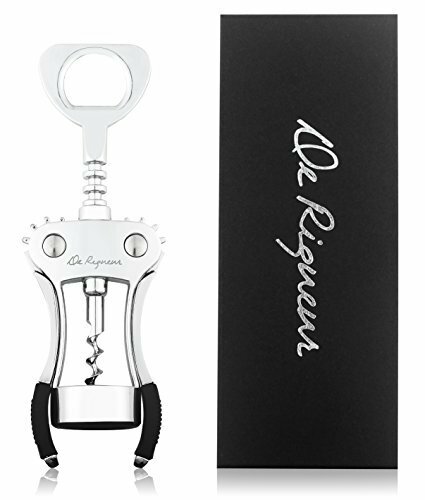 Don't waste more money on another corkscrew that will leave you disappointed and without wine - choose De Rigueur's high value, no-risk corkscrew today! Special Low Price Will Not Last Long... Click 'Add to Cart' and Buy Now! WINE GIFT - This is the best wine opener for anyone on any occasion: Valentine's Day, housewarming, birthday, engagement, wedding, anniversary, mother's day, father's day, graduation or just as a nice gesture or thank you gift. FASHIONABLE - A wine corkscrew is a must-have barware accessory for every wine drinker, connoisseur, hostess or host. Your friends will be jealous of you with this stylish bottle opener at your next dinner party, get-together or any occasion where there is wine. RELIABLE - Chrome plated, solid metal construction that is built to last. You can depend on this wing corkscrew for a lifetime as you feel the quality in your hands. It effortlessly removes all cork types and easily opens beer bottles as well. FREE E-BOOK - Emailed directly to you after your purchase (no strings attached). "Good Wine Guide" is your source to everything wine; red wine, white wine, from choosing the correct one to the art of wine tasting. Become a Sommelier and impress everyone with everything you know about wine. COMPLETE LIFETIME WARRANTY - We expect you to be completely happy with your purchase. However, if you are not satisfied, we will give you a free replacement or 100% of your money back, no questions asked. If you have any questions about this product by De Rigueur Brand, contact us by completing and submitting the form below. If you are looking for a specif part number, please include it with your message.